A few months ago, I had the opportunity to explore Cynthia Leibrock’s Green Mountain Ranch in Colorado. Let me start by saying it’s gorgeous! Green Mountain Ranch in Colorado seamlessly blends the natural beauty of its surroundings with sleek and accessible design. 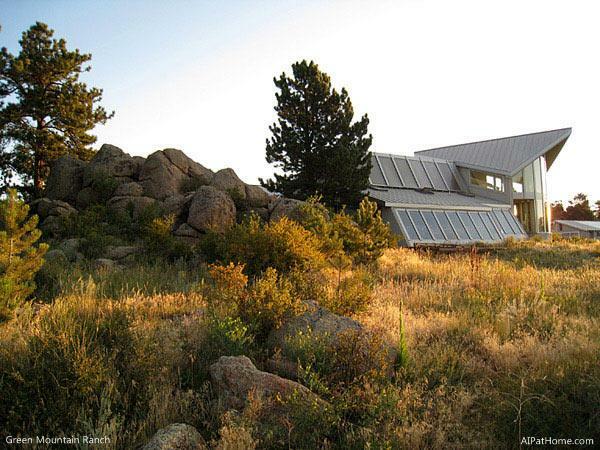 Nestled into hills and meadows, the home has an incredible way of bringing the scenic outdoors in. It does an equally fine job of integrating universal design elements—and nearly seamlessly, at that. Each room holds hidden features that make life just a little bit easier without looking the least bit institutional. Low glare on all floors to prevent veiling reflections which are perceived as puddles of water (slipping hazards) by people with reduced vision. 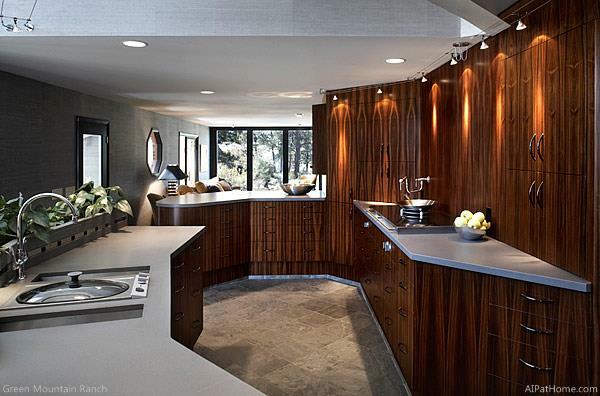 The kitchen, which takes center stage in the home, is particularly no-nonsense in its approach to functionality. Cabinets and drawers slide out, pull down, and rise up to a more comfortable height. Appliances and fixtures are easy to operate and specialize in the most healthful ways to prepare food. Everything has a dedicated space, from heavy appliances and mixing bowls to drinking glasses and silverware. 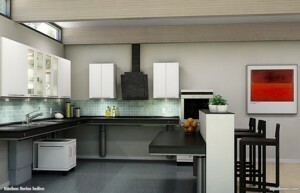 The result is an efficient, well-organized kitchen that works for people of all abilities. Separate work stations are key to the kitchen’s high-functioning character, and multiple sinks and faucets are the hard workers here. Food preparation can be simpler for anyone if they have the right equipment. Right above the stovetop, a wall-mount pot-filler puts water on tap—no more lifting and lugging heavy pots of water. 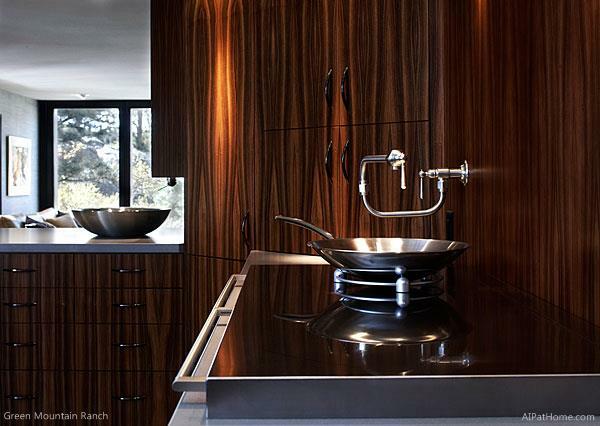 At a work station kitty-corner from the cooktop, a pasta cooker is flanked by two narrow trough sinks. At one, an instant hot-water dispenser provides easy steeping and sterilizing, and a classic lever-handle faucet at the other provides non-grip convenience. 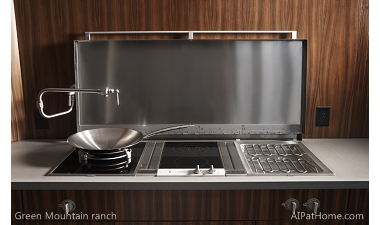 Guests are encouraged to pitch in with cooking, and it’s actually fun to wash and rinse with a unique setup: a stainless steel vessel sink and a mirrored cabinet with integrated faucet. Around the corner, a durable double-basin sink and easy-to-maneuver, high-arch pull-down faucet handle the toughest cleanup, including large pots. If you ever get the opportunity to see Cynthia’s home in person, I highly recommend it. In the kitchen and beyond, the universal design and healthy living features of this home are rivaled only by Cynthia’s hospitality. It’s truly a one-of-a-kind experience. Jo Brown is Web Content Editor at Kohler Co., and also manages the Kohler Community.